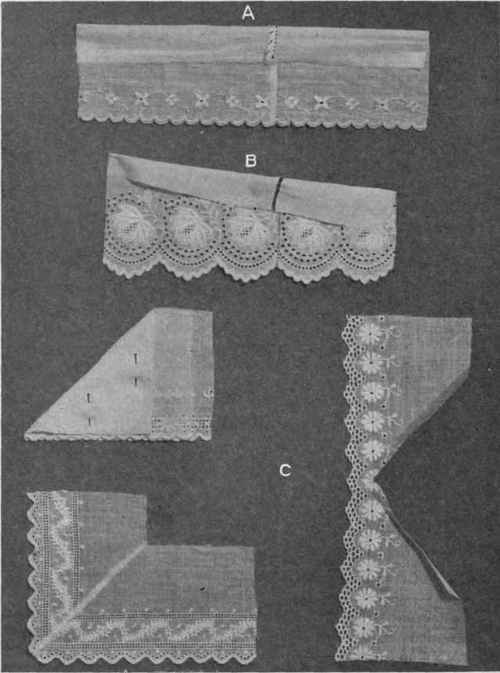 When joining fine lace, for the neck of corset covers, night-dresses, lingerie waists, lay one end of the lace on top of the other, so that one pattern covers the other, matching exactly, and baste; sew around one side of pattern, and through mesh in an irregular line, with fine hemming and an occasional buttonhole stitch; or if lace is not very fine, use all buttonhole stitches. Trim the ends of the lace away close to the buttonhole stitches; the join will look like an irregularity in the weave. 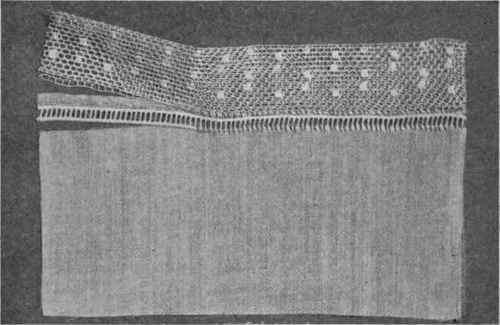 Cluny and other laces that ravel badly will need to be joined by a seam, and the ends hemmed or buttonholed to keep them from fraying out (Fig. 159). To miter lace an attractive finish can be made by fine buttonholing or embroidery. Fig. 158. - Cord edge of entre-deux overhanded to raw edge of material; footing to raw edge of entre-deux. Fig. 159. - Lace joined invisibly. Match the pattern, either between the scallops, or directly through the center. Use a plain seam, overcast, hemmed fell, or buttonhole the two raw edges, when mitering corners, or in making seams (Fig. 160). Washable ribbon is best to be used for undergarments. Fig. 160. - Embroidery joins. Upper row, plain seam; second row, edges buttonholed together; lower row, mitered corner with details of making. This will retain its freshness longer if removed from the garment and washed in cold water, with Ivory soap, by itself, stretched and allowed to dry, or pressed with moderately warm iron when nearly dry. The choice of color will depend upon individual taste; white is always dainty and does not in any sense betray lack of good taste; if color is worn good taste requires that it be dainty. Linen bobbin, such as is used in the necks of infants' dresses, or lingerie braid, the latter to be had in colors, are satisfactory substitutes for ribbon. A tiny chain of Irish crochet thread, made by needle or fingers, is sometimes used. The most attractive way to finish the armhole of a corset cover or underbodice is to repeat the finish of the neck, omitting, unless specially desired, the beading and ribbon arrangement. A bias facing is sometimes substituted for the various other finishes shown here. (/) Sleeves. - A plain seam, bound with a bias strip of the material of the garment, makes the best plain finish for a sleeve at the armhole. Entre-deux is sometimes set into the armhole and the sleeve with a French seam, and the sleeve gathered and set into the entre-deux in the same way, or else rolled and whipped on. Repeat the design of the neck finish. 1. How should material be prepared for cutting out garments? 2. State a general rule for placing a pattern on material for cutting out undergarments. 3. How would you baste for fitting: (1) Corset cover, (2) petticoat? 4. Name and describe the making of three seams which can be used in making undergarments. 5. Describe three kinds of decoration suitable for petticoats and drawers. 6. Describe the method of bias cutting; joining bias strips. 7. Name three kinds of placket facings and tell where used.